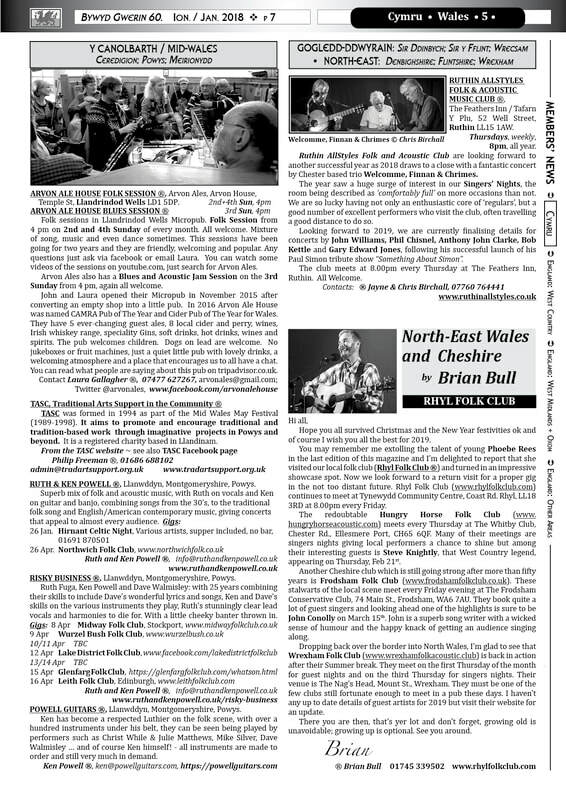 Page-header: Arvon Ale House Folk Session, Temple St, Llandrindod Wells LD1 5DP. 2/4 Sun, 4pm. 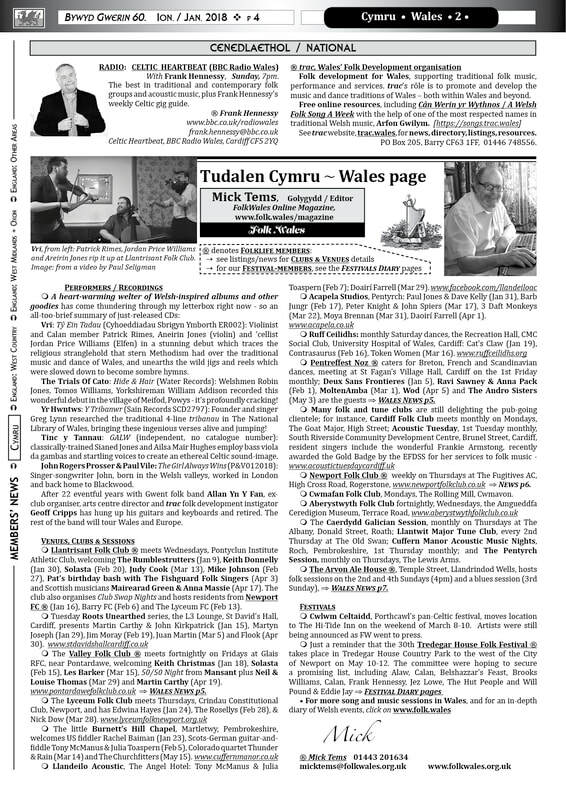 Folklife Traditions: Clera - playing Welsh traditional instrumental music, by Meurig Williams. See article at foot of these news pages. ⊕ The 30th Anniversary Festival. A weekend of international dance, music, song and storytelling. Music Guests: to be confirmed. National and international dance teams. Friday Evening: Ceilidh with Calennig Band & Pat Smith; Concert sponsored by Newport Folk Club. Saturday afternoon: Llantrisant & Lyceum Folk Clubs with guest; Evening ceilidh; Evening Concert. Sunday Afternoon: Concert. Online tickets may be available (TBC) from the Riverfront (Newport) Box Office. Prices: see website for more details. You can park in the Tredegar House Car Park; National Trust Car Parking Charges will apply. ⊕ Tŷ Gwerin, the home of folk traditions in the splendid Yurt at the National Eisteddfod. 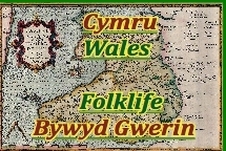 Tŷ Gwerin hosts all folk and traditional events on the Maes, and brings together all the folk traditions of Wales in the most eclectic and widest context. Enjoy a different view of some of our oldest cultures, as the Tŷ Gwerin builds on the success of the past few years. 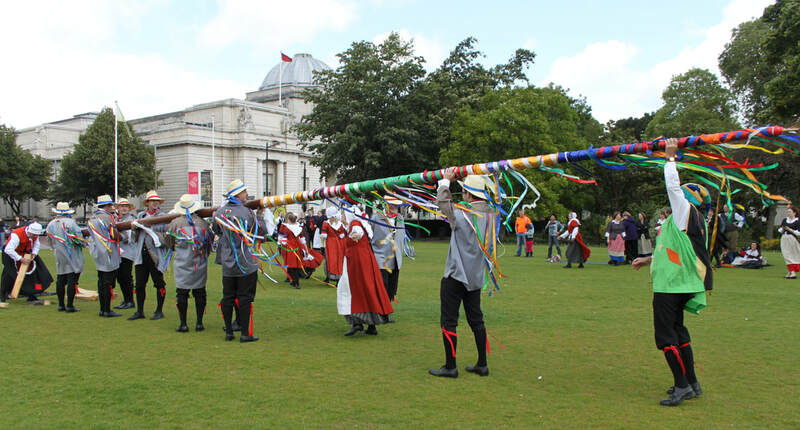 The project partners are Trac, Clera and the Welsh National Folk Dance Society. Join us for a packed programme of performances, sessions, interviews, children’s activities – and don’t forget the retail therapy at trac’s own shop, which stocks a collection of folk CDs and books you won’t find anywhere else! 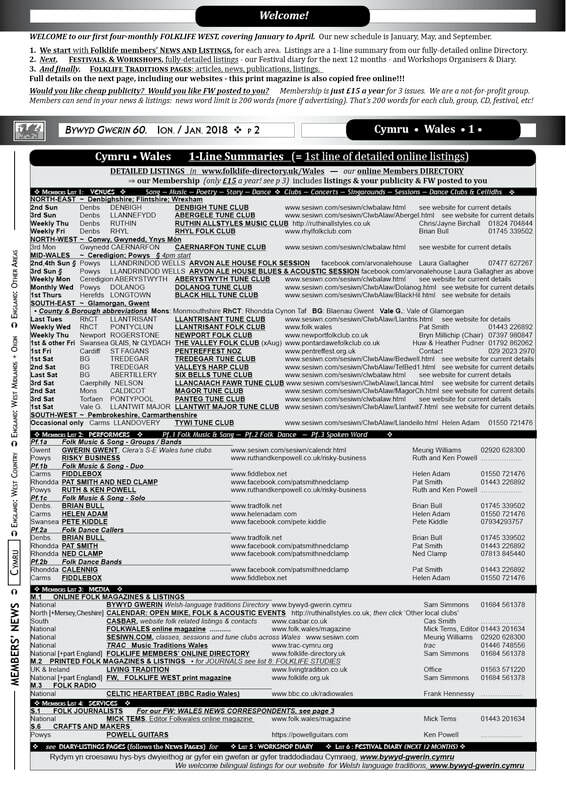 ✪ More music, song, dance, and poetry, in the rest of the Eisteddfod! → LLANWDDYN, Lake Vyrnwy, Powys. At Llanwddyn Community Centre, Abertridwr, Llanwddyn, Lake Vyrnwy, SY10 0LR - See website for map and directions (they are needed). ⌂ 01691 870501 or email: info<at>llanwddynevents.co.uk Postal address for tickets: Llanwddyn Events, 30 Abertridwr, Llanwddyn, Powys SY10 0LR (cheques payable to Llanwddyn Events). Tickets available from 1 January, see website. See also Facebook. Early Bird Rate from 1st Jan to 30th March! ⊕ A small homely festival that packs a punch ! We have a fantastic line up once again! 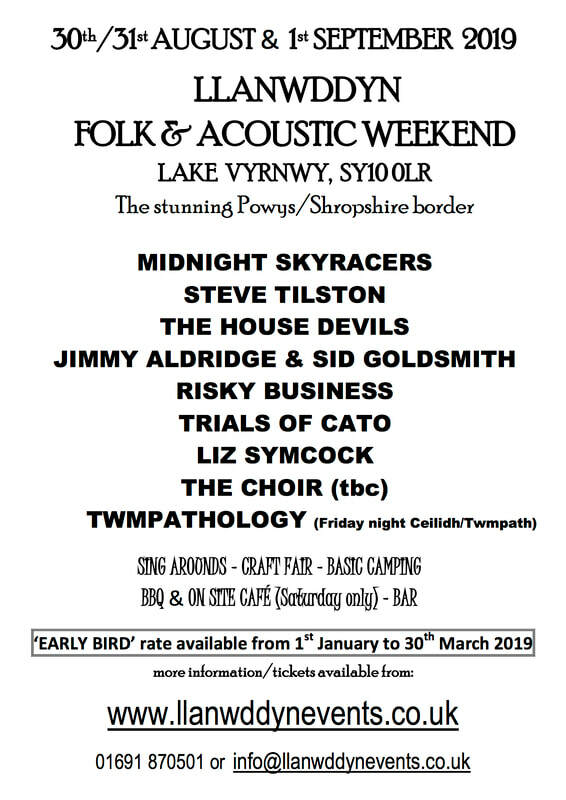 The Midnight Skyracers, Steve Tilston, The House Devils, Risky Business, Jimmy Aldridge & Sid Goldsmith, The Trial of Cato, Liz Symcock, A Choir (TBC), Twmpathology (Friday night Ceilidh/Twmpath). With 70% returnees every year, it’s always best to get your tickets early. Friday night - ceilidh and hog roast supper (included in the weekend ticket price), Saturday - Concerts from 1pm - Sing-arounds in the bar. Basic Camping (see website for details), Bar over the weekend, Onsite Cafe & BBQ on Saturday. Festival celebration folk service only on Sunday @ St Wddyns Church. 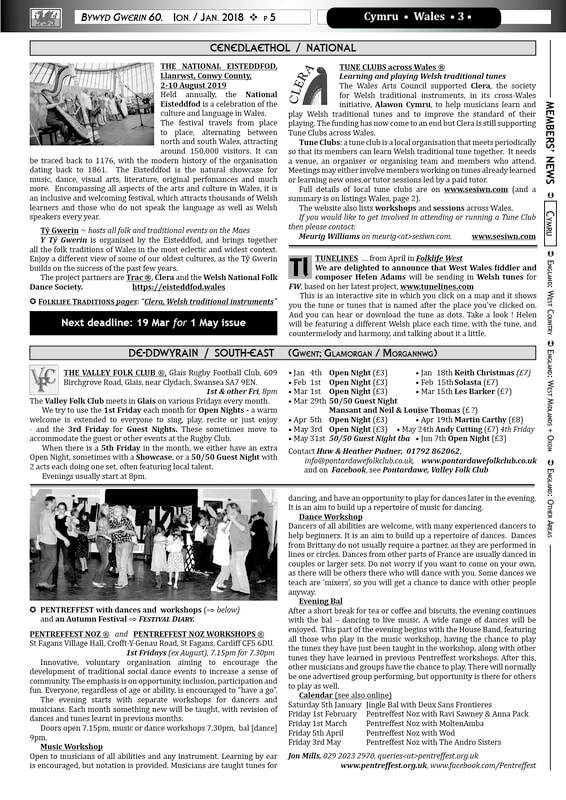 ⊕ A weekend of bals, dance and music workshops and other events. Musicians and Dance tuition tba. 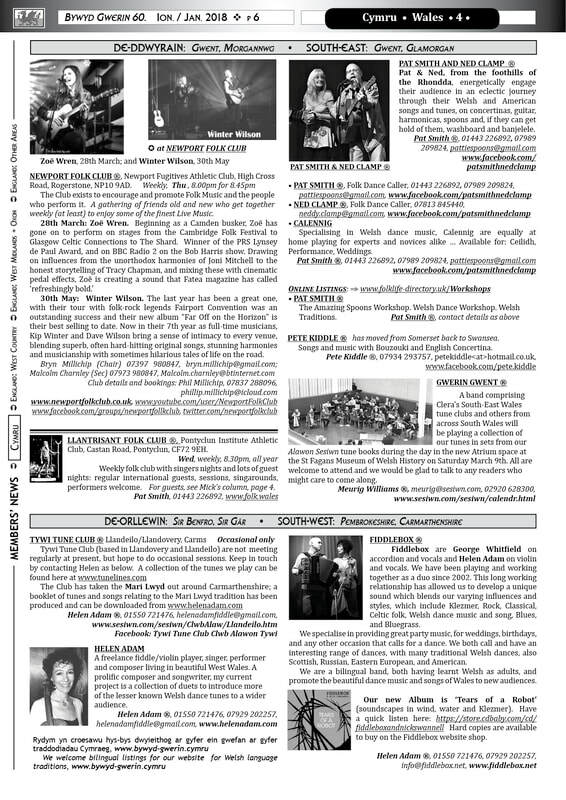 Dances, Workshops, Sessions & a great time! Weekend Tickets prices tba. Food available (please book) Camping (indoor & outdoor), some space for vans and caravans. Friday Evening: Bal; Saturday Morning & Afternoon: Dance and Music Workshops; Saturday Evening: Grand Bal; Sunday Morning: Dance and Music Workshops; Sunday Afternoon: Dance with music from workshop participants, local artists and foreign guests. 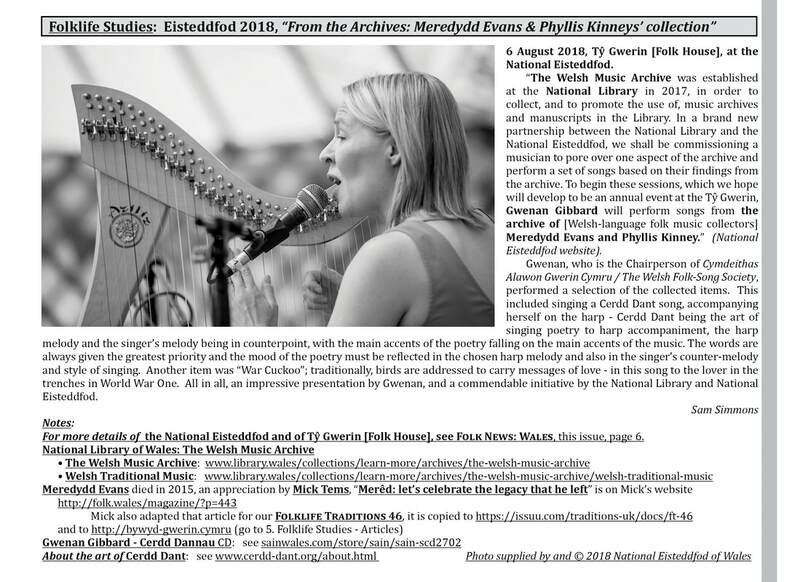 Wales News from Folklife members. Clera - playing Welsh traditional instrumental music, by Meurig Williams.